Though I’m not really quite sure why anyone would hate them especially, because what’s not to like about pumpkin spices? Cinnamon, nutmeg, ginger, maybe a few other fall favorites depending on your personal blend… mmmm. Maybe it’s the adding to coffee thing that’s the problem? I guess I kind of do prefer my coffee a little simpler myself most of the time. But as far as I’m concerned you might has well go ahead and put pumpkin spice in pretty much anything else you can think of. Muffins! Pie! Cookies! 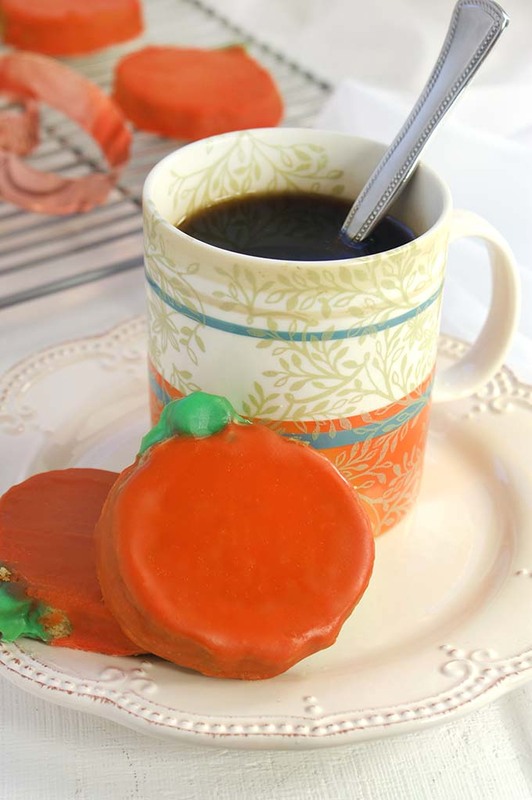 Pumpkin spice definitely belongs in cookies. Let me tell you about these cookies my friends. They are lightly sweetened without the frosting (perfect for the grown ups). And normal cookie sweet when frosted (perfect for the kids). Of course they are chock full of big ole’ pumpkin spice flavor. 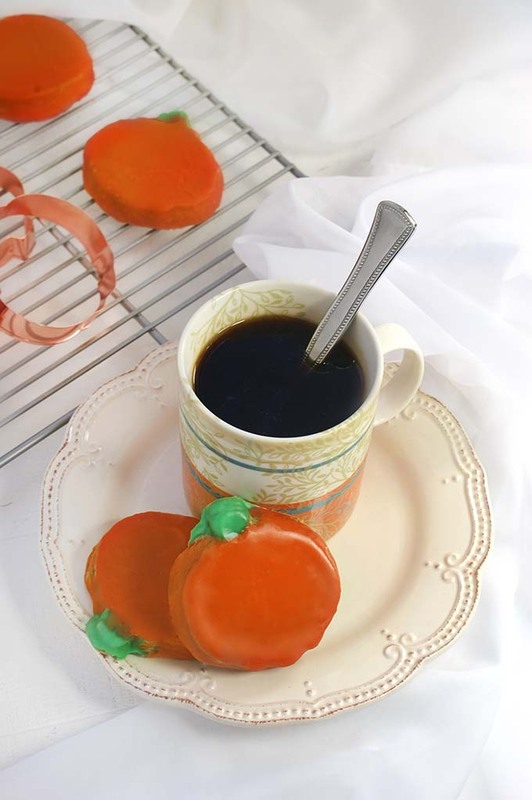 Though they contain no actual pumpkin, so if your not a pumpkin lover don’t run away yet! The texture on these babies? Well, actually they just so happen to turn out perfectly soft and just a little bit chewy. And the great texture holds up even after stored in an airtight container for a couple of days. And if you cut them into pumpkin shapes and frost em orange? They happen to be insanely cute and just the ticket for a fall or Halloween treat. Plus, the cookies are no-chill making this is the perfect fall baking project to do with the kids. (Mine always get impatient when we have to wait for the cookie dough to chill.) I haven’t met a kid who doesn’t love cookie cutters and orange icing! So… basically this is everything you could want in a cookie. I’m pretty sure you’re going to want to make cookies now, so, happy baking! 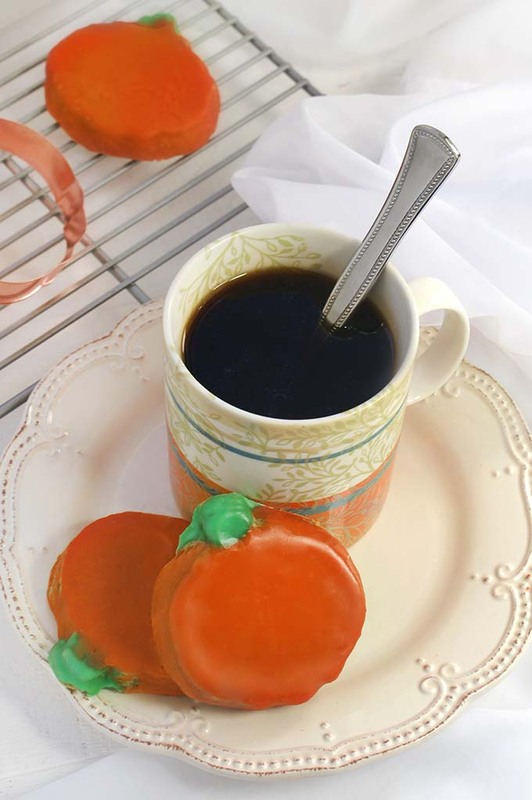 Pumpkin Spice Cookies– Yields 16-20 cookies. Adapted from The Ever Best No Chill Suagr Cookies. 1. Preheat the oven to 350*, and line two baking sheets with parchment paper. Add flour, sugar, brown sugar, baking powder, cinnamon, cloves, and ginger to the bowl of a large stand mixer. Use the mixer on low to combine all dry ingredients well. 2. Add the butter, half and half, vanilla and egg to the bowl. Mix on low until a thick dough is formed. Note: You may need to stop the mixer to loose the butter enough to break it up. There will be small visible bits of butter in the finished dough, this is ok.
3. Lightly flour your work surface. Roll the dough out into a rectangle about 1/2 inch thick. If the dough sticks to the rolling pin, dust it with flour too. Use the cookie cutter shapes of your choice to cut out shapes. Place them on the prepaired baking sheets 1inch apart. Note: Extra dough can be re-rolled once or twice to cut out more shapes. However, after once or twice the extra dough will not really stick together well anymore because of the extra flour used for dusting. Extra dough can also be rolled with hands into a ball and flattened into a normal circular cookie shape. 4. Bake the cookies on the two center racks at 350* for 10-14. (Please note if you rolled your dough out thinner you will need to reduce bake time.) If baking both sheets of cookies at once rotate the trays about half way through baking time. Note: Watch the cookies closely after 10 minutes as baking time will varry depending on how close to 1/2 thick the cookies actually are. Also keep an eye on the bottoms of the cookies on the lower tray to ensure they don’t burn. 5. Cookies will be an even medium brown and still semi-soft to a light touch when complete. The bottoms may be a slightly darker brown, but not burned. Remove from oven and allow the cookies to cool completely on the tray before frosting if desired. Note: We loved 1/2 teaspoon of cloves in the cookies, but it was pretty assertive. Some people may prefer 1/4 teaspoon for a softer flavor. If you are unsure I’d start with the 1/4 the teaspoon and add the additional 1/4 teaspoon from there if you find you like the taste. Shiny Orange Glaze– Yields about 2/3rds a cup. Adapted, barely from King Arthur Flour. A small splash of red food coloring and a small splash of yellow food coloring. I used about 1 part red to 2 parts yellow to achieve my color. 1. Add all ingredients except milk to a medium sized bowl and mix using a spoon. Add one tablespoon of milk and mix really well. Note: You’ll have to mix more then you think you should. 2. A glaze will start to form. After stiring well add an additional tablespoon of milk if needed to reach the right consistency. Note: How much milk you use will depend on how much food coloring you have used. The final glaze should be spreadable but not runny and all the powdered sugar should be dissolved. 3. Spread the glaze on the cookies and allow it to sit uncovered, to fully harden before serving.